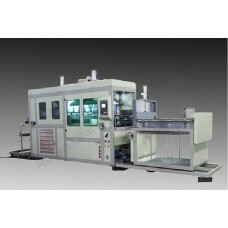 1.The machine designed for forming thermoplastic sheet into different shapes of packaging model. 2. Suitable plastic sheet material : PVC , PE , PET , PP & PS , HIPS. 3. 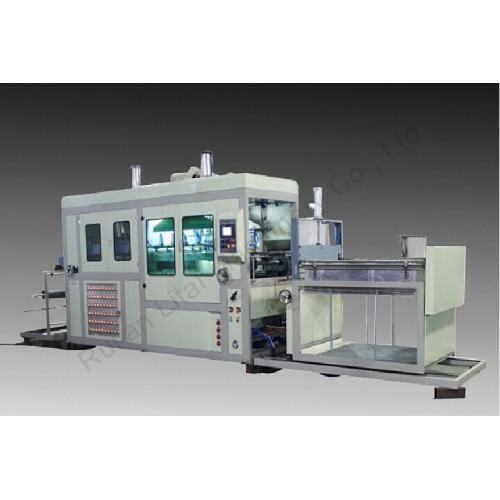 Its finished products are widely used in sealed package of toys, hardware, cosmetics, electronic products (batteries, electronic components and so on), foodstuff (fruits pallets, snack boxes, biscuit boxes, food dishes, trays etc.). Forming size: L1220mm x W720mm Touch screen & PLC made in China—TAIDA,more reliable. Vacuum Pump made in Germany—Rietchle Cutting station: It cuts each batch of products. Forming station. The chains send each batch of food containers to cutting station to cut.